We had a bay window that needed some more functional seating, so we decided to build a DIY bay window bench to wrap around the entire nook. Our little breakfast nook has been totally transformed with this new banquette, and today I’m showing you how we did it! Y’all, I’m not even sure where to begin here. 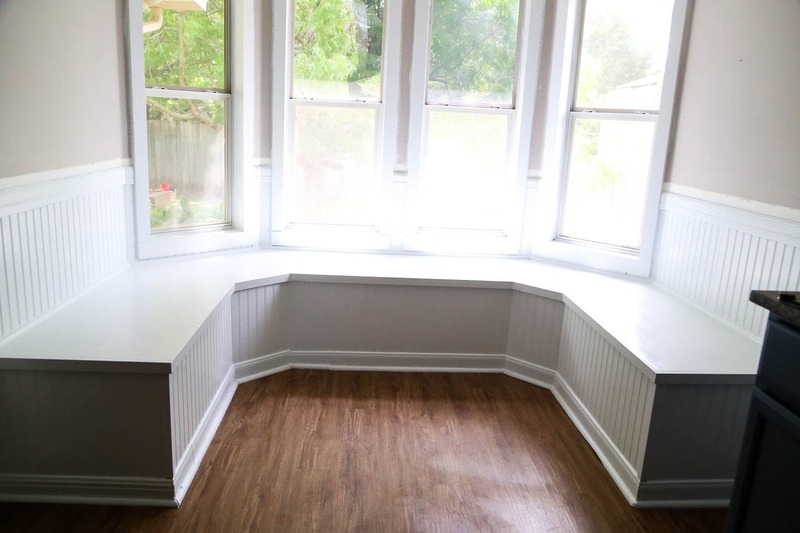 The bay window bench in our dining room is officially complete and I’m so happy I could cry. Maybe I did cry. Don’t judge me. I’m allowed to cry. But seriously, it feels so good to be able to say that this little old banquette is finally finished, and I can honestly tell you it is my new favorite seat in the house. It’s the best – I love to work from the bench and look out the windows and watch the squirrels that like to fight in our trees every morning. Jackson loves to climb to the very middle of the bench at dinnertime and be as wiggly as he wants to while he eats. Heck, it’s deep enough that I might even take a nap there. We’ve actually accomplished slightly more than what you’ll see here today (if you’re keeping up with my Instagram stories, you can see all of the behind-the-scenes and sneak peeks ahead of time! ), but I’ve been promising a big tutorial all about the bench and that day is here. I’ve mentioned a few times that we are working with The Home Depot for this project, but let me just take a moment before we dive into the tutorial to one again acknowledge how amazing that is. I seriously get a bit emotional every time I get to tell someone that we have the honor of partnering with Home Depot on projects like this, and I still can’t really believe this is my actual job. I’m so grateful to you, my readers, for supporting our dreams because we wouldn’t be here without you. And, of course, I’m so incredibly thankful for my wonderful friends over at The Home Depot and the fact that they believe in us. It’s pretty incredible to know that one of my favorite stores in the entire world supports and encourages us and is sitting on the sidelines cheering us on and helping us out. Maybe it’s the pregnancy hormones, but it just makes me a little teary. Basically? 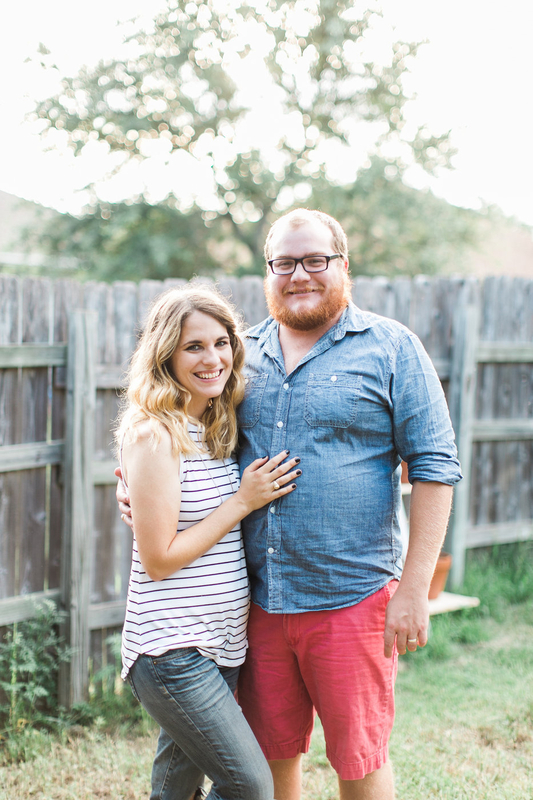 I’m a sappy mess and I’m in love with this bench and so happy to be sharing it with you today. But, let’s lose the emotions (or at least try), and I’m going to tell you all about how we got it done. I know you might not be ready for such a bulky, heavy post after our big tiling tutorial earlier this week, so you can always pin this for later if you just need a break before taking it all in. I understand. It’s a lot. I’m exhausted. Maybe I’ll just go take that nap right now? 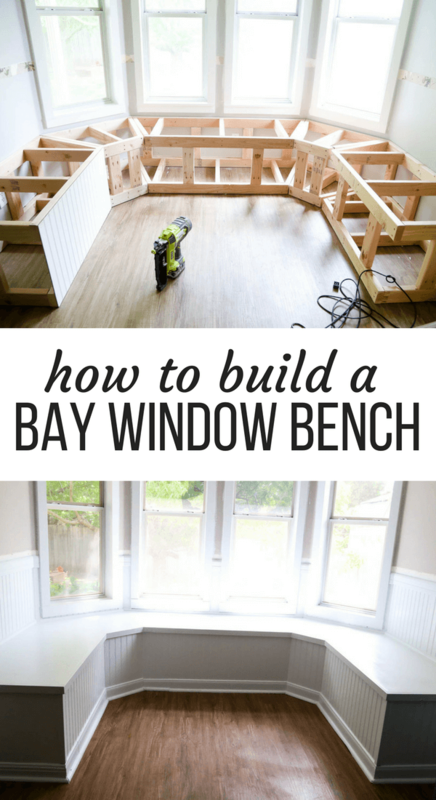 But, in all seriousness, let’s dive into chatting about this DIY bay window bench and how it came to be. This project was a major labor of love, and I have to give most of the credit to Corey and his amazing woodworking prowess for putting it together over the last few weekends. You know, instead of relaxing because he has a full-time job and probably didn’t really feel like building a banquette. *Note: All material amounts and measurements will depend on the exact size of your bay window and how large you want your banquette to be. 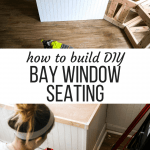 Every bay window is different, so I’ll keep the instructions relatively general – just know you may need more or less of each material than we did. Obviously, the first step with building your DIY banquette seating is to make a plan. 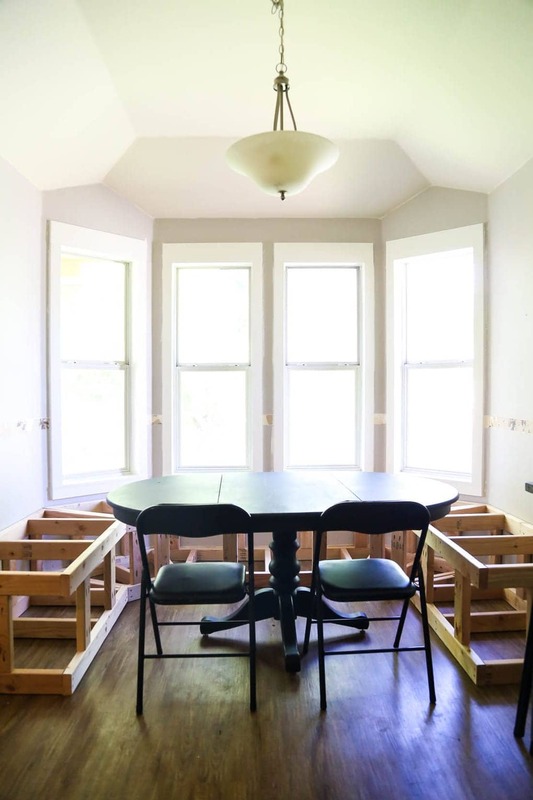 We knew that we wanted the bench to fit under the bay window and also wrap up the sides of the wall a bit – we wanted people to be able to comfortably sit at both ends of the table, and we wanted the ability to upgrade to a wider table down the line. Our bench is about 22″ deep and comes out from the bay window about 47″ inches. 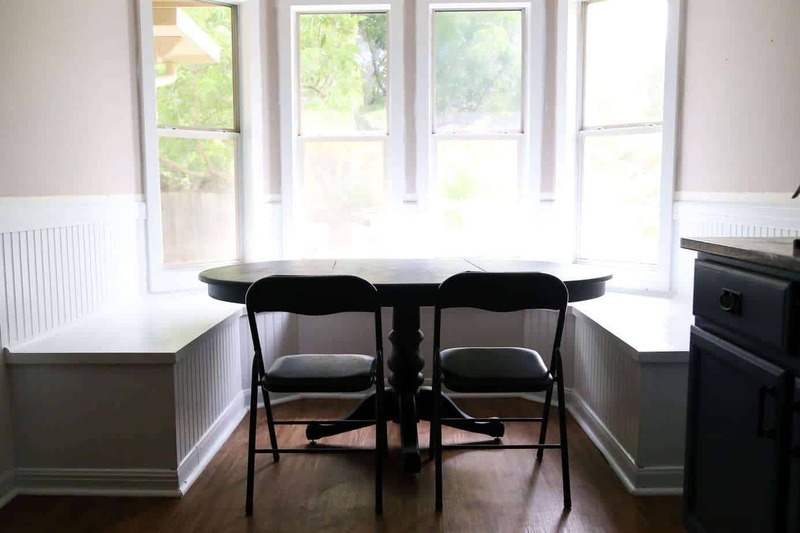 These measurements will all depend on your specific bay window, though, so spend some time in the space thinking about what will work best for your family. As far as the height of the bench, 18″ is standard seating height. Due to a slight mistake in measuring, ours ended up being a bit taller – the finished product is about 20″ tall. It’s definitely taller than is ideal, but it’s still perfectly comfortable to sit with your legs under the table (even for Corey) and our table is a good 2″ shorter than standard table height. So, in the end, once we upgrade to a new table we feel pretty confident that the bench height won’t be a problem at all. 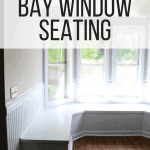 The other measurements you’ll need to take involve the angles of the bay window. This is where things get a little complicated, so I apologize if it’s confusing. Corey started by taking the measurement of the angled corners using a digital angle finder. Once he knew the size of the angles, he divided that number in half to figure out the angle that the two base pieces on either side of the corner would need to meet at. From there, he built the bases (see next step), ensuring that the corresponding sides were angled to the appropriate measurement for the corner. STEP TWO: Build the Base of the Banquette. 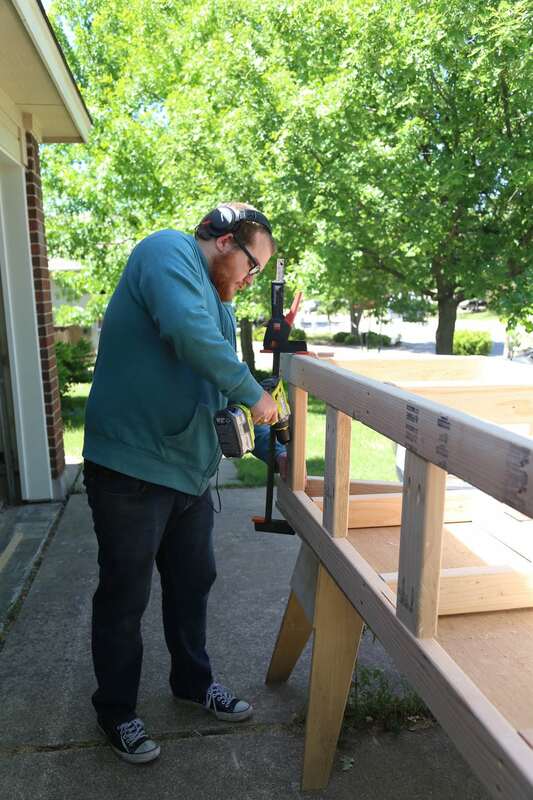 For this part, Corey built a separate base piece for each time the bench would turn. So, the bay window itself consisted of three separate pieces, and then there were two other pieces for the sides. For the angled ends, Corey just placed the digital angle finder directly onto his miter saw and adjusted it so that the angles matched up before he made his cuts. This ensured the two pieces would fit together perfectly, and was a quick way to set things up. Above, you can see what the base pieces looked like. It’s basically a frame that perfectly fits the shape of the section it’s going in, with supports along it to keep things sturdy. Corey constructed these base pieces using pocket holes, a lot of measuring, and more patience than I can imagine ever possessing. As each base piece was built, we brought it into the space to make sure it fit perfectly. Once all of the pieces were constructed, they got attached both to each other and to the studs in the wall. It all was looking a little crazy at this point, but we were starting to get a peek at what the finished product might look like, and it was exciting! 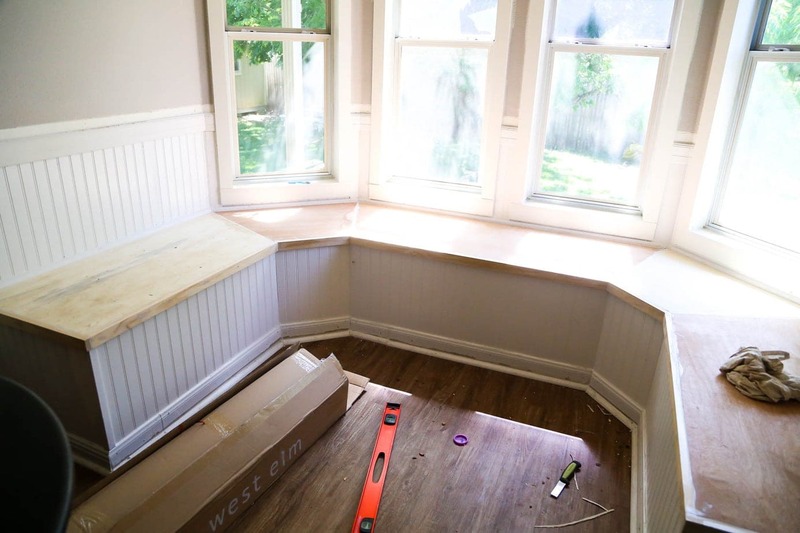 Next up, we attached our beadboard to the front and sides of the bay window bench. At this point, you’re mostly done with the crazy angles (thank goodness!) so it’s just about measuring a piece to fit the front of the piece you’re working on and then attaching it using the power nailer. Then, Corey cut the 1/2″ plywood to fit on top of the base pieces (again, cutting a separate piece for each time the wall turned) and attached using wood glue and screws. He sanded down all of the seams to make sure everything was nice and level (and we sanded again later, but this was just an initial pass-through to make sure everything fit together correctly). This is the part of the build where you’ll probably start to worry. Things will be looking really crazy, sloppy, and just generally awful. This is totally normal and to be expected. Once you add trim, caulk, and paint, things will look way better, so try not to stress and just push forward. Now, you’re ready to begin the more satisfying part of the process – making it pretty. 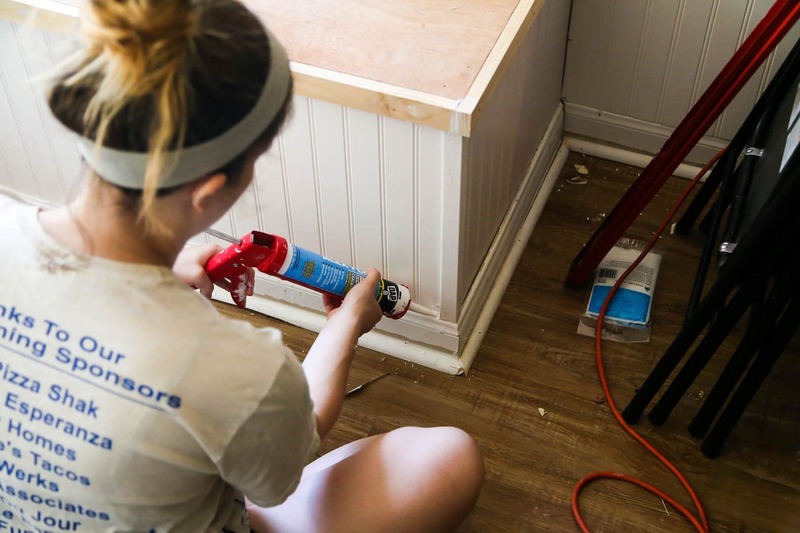 The first step is to re-install baseboards in your space. 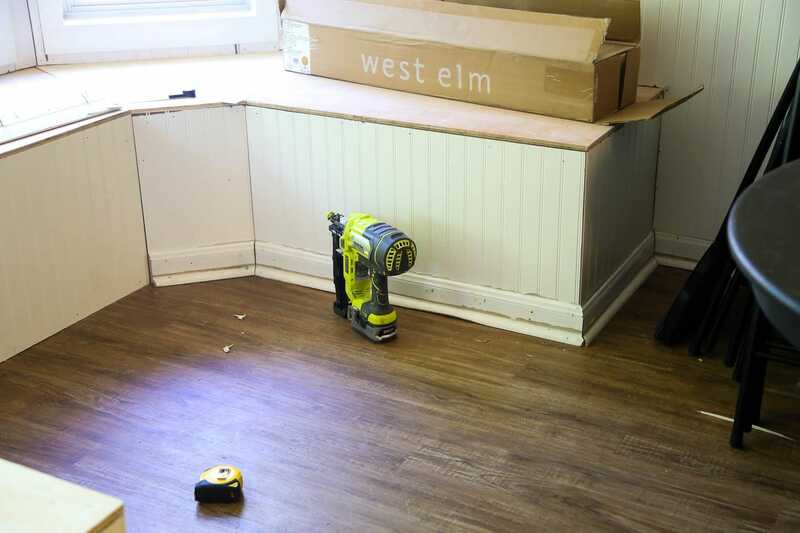 We had saved the baseboards when we pulled them out originally, so it was just a matter of re-cutting them to fit the bench and installing them. It required a bit of extra sanding and prep work when it was time to paint (since they were pretty beat up) but it saved us a fair amount of money, which is always a win. 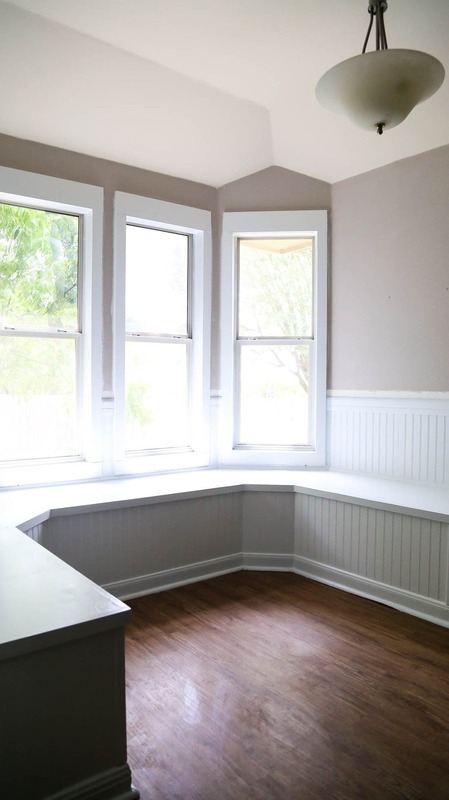 Once the baseboards are back in, you can install the rest of your trim. 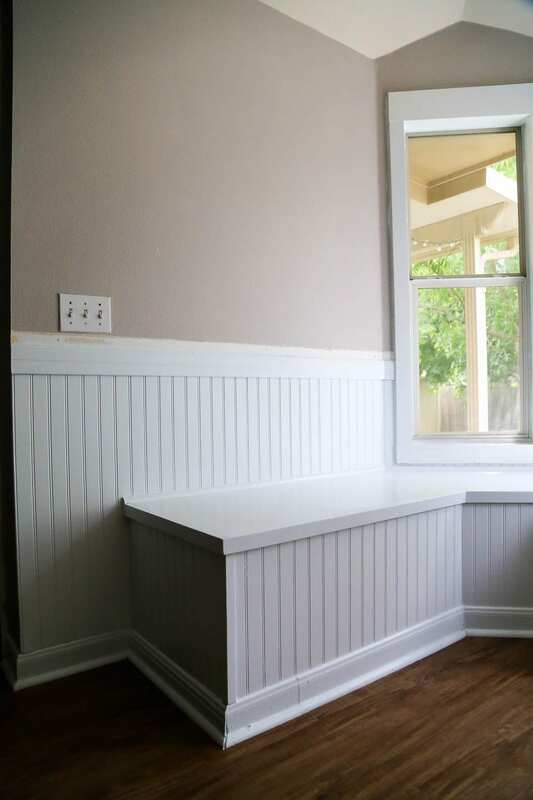 We did a piece of 1X2 trim all around the top of the bench (it sits flush with the plywood top and makes it appear to have an overhang), then we also added corner molding on the outside corners and some shoe molding around the back of the bench where it meets the wall. If you’re doing beadboard on the walls around your bench, this is the time to do that as well (do it before you install the trim). Beadboard is extremely easy to install – just cut it down to the appropriate size using a circular saw and then nail into place. Install your chair molding around the top of the beadboard, and hopefully at this point you’ll start to feel like things are looking up! Once all of your trim is installed, you’re ready for the final step. Caulk all of the nail holes and anywhere two pieces of wood meet each other. 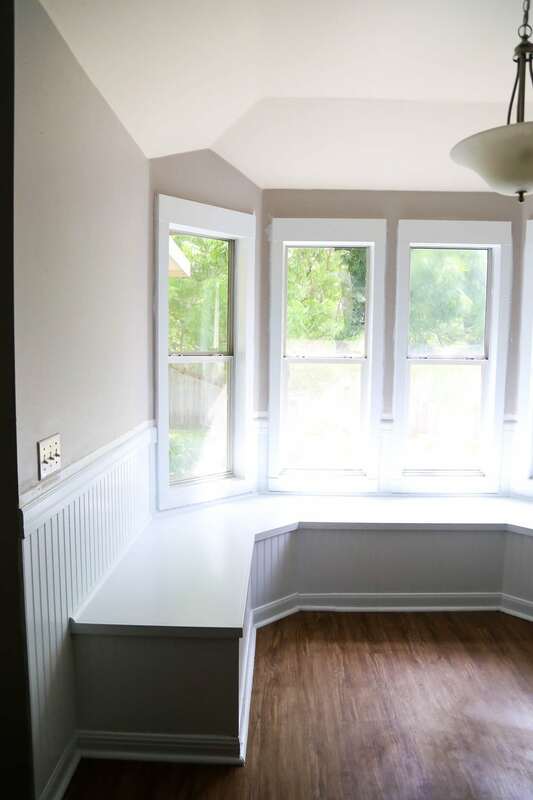 You’ll want to caulk the beadboard seams, the seams between the trim and the beadboard, etc. Basically, anywhere you can see a small gap between wood, add a bead of caulk and smooth it out with your finger. This process is tedious and messy, but oh so worth it. Once the caulk dries for about 30 minutes to an hour, you can paint! I used a combination of an angled paintbrush and a small foam roller to paint both the bench and beadboard. 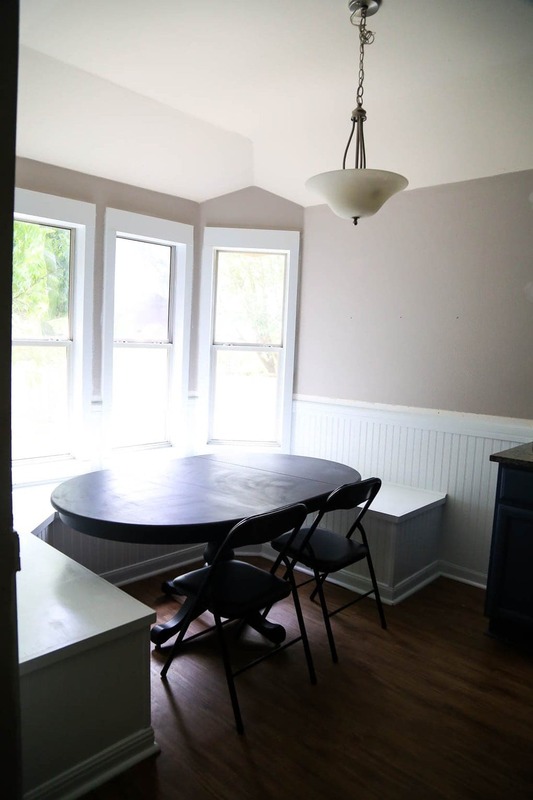 We used Behr’s Polar White for the bench and the walls – I think it’s the perfect creamy white that isn’t too stark white. After you’re done painting, seal the whole shebang and you’re good to go! We still need to add a few throw pillows to cozy things up a bit, but that will come next week for the big reveal. OH MY GOODNESS NEXT WEEK IS THE BIG REVEAL. Basically, all that’s left is wallpapering (which, spoiler, is in progress! Keep reading for a sneak peek! ), adding and accessorizing the open shelving, and installing our amazing chandelier. With a week left, I think we can handle it! I really just don’t have any words. I think we can safely just end the post right there. 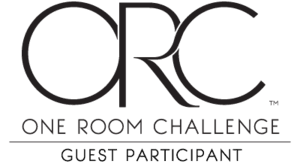 Psst: Don’t forget to check out the One Room Challenge Linkup to see all of the other amazing spaces! Oh man, that wallpaper is the best!! You guys did such a great job! 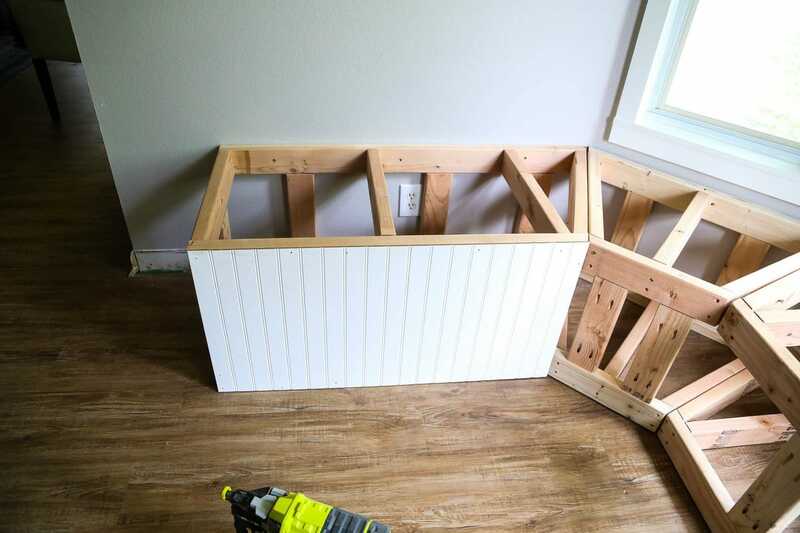 Did you guys consider making the bench portion extra storage space (like, with doors or drawers)? 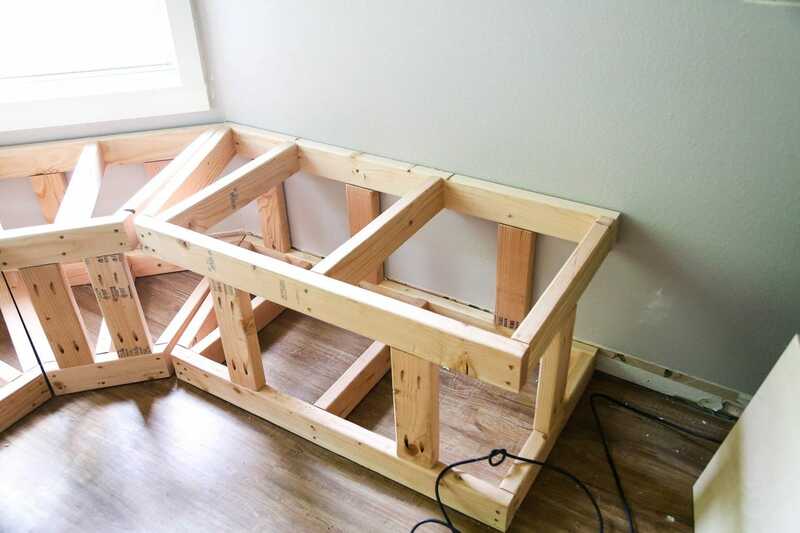 I asked my husband for a storage bench like this in our kitchen, and the storage portion has thrown him for a loop. So he hasn’t started yet haha but it seems like such a good idea for a small kitchen/dining area?! We definitely did consider that! Having the bench contain storage was our original plan, but due to a lack of time (and trying to keep the budget down), we decided to skip it. If we had done it, we would have just hinged the top of the bench so that it could be lifted! 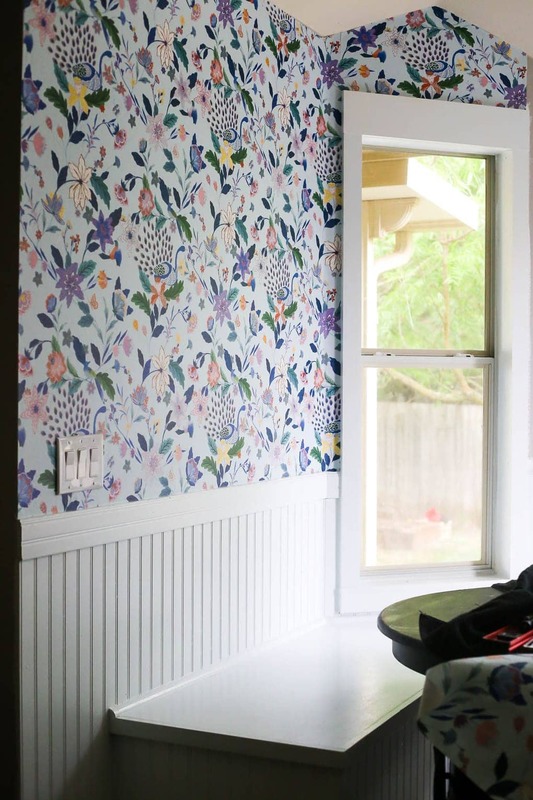 That wallpaper tho…I’m absolutely smitten. I can’t wait to see it styled with throw pillows! Thank you! I’m obsessed too – I cannot WAIT to finish accessorizing!